Offered individually, by the pound or as a gift tray, our hand-decorated cookies are both festive and delicious. For Easter, we feature seasonal shapes, including tulips, eggs, baby chicks and bunnies. These delicate and beautiful morsels are made with a traditional French butter cookie recipe, and each cookie is individually iced, by hand. 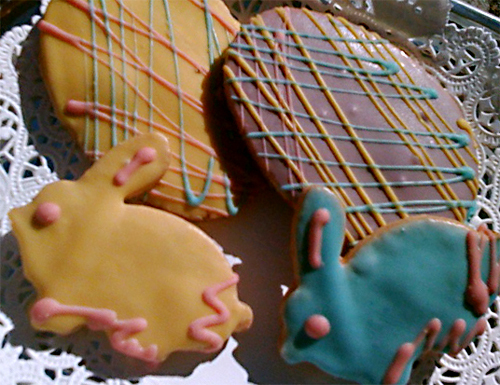 Drop in to visit us at La Renaissance to pick up some special Easter cookies for your family or as a gift for friends or co-workers. Download a full-size PDF of our Easter menu here.